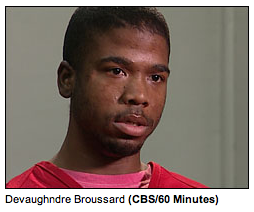 Less than two weeks before the start of the trial of two men accused of killing journalist Chauncey Bailey, CBS News has released a transcript of confessed gunman Devaughndre Broussard’s February 2008 interview on “60 Minutes” that includes dialogue that was not broadcast. The document shows that in unaired portions of the interview Broussard stuck to what was then his story: that he falsely confessed to Bailey’s murder to protect the person he referred to at one point as his “commanding officer” — former Your Black Muslim Bakery leader Yusuf Bey IV. The transcript is posted at http://www.cbsnews.com/stories/2011/03/10/60minutes/main20040084.shtml. Broussard has since testified before a grand jury that he did kill Bailey — at Bey IV’s order to stop the publication of a story about the bakery’s finances in the Oakland Post, where Bailey was editor. Bey IV and Antoine Mackey, both 25, are facing murder charges in connection with the Aug. 2, 2007, shooting death of Bailey. A CBS spokesman said in an e-mail that defense lawyers had subpoenaed unaired portions of Broussard’s interview with reporter Anderson Cooper in which Broussard denied the killing. Broussard initially said he didn’t shoot Bailey, then confessed to police, saying he acted alone, then claimed the confession was false, then agreed to cooperate with prosecutors in exchange for leniency. It appears CBS News’ posting of the transcript precedes its turning over of unaired interview tapes to both Bey IV’s lawyer, Gene Peretti, Mackey’s lawyer, Gary Sirbu, and the prosecutor in the case, Alameda County deputy district attorney Melissa Krum. By releasing the record of the entire interview, the network escapes having to either fight a subpoena for non-broadcasted material or the appearance that it is “working hand in glove with (attorneys) and the court,” said Peter Scheer, executive director of the San-Rafael based First Amendment Coalition. “It’s a legally informed strategy to do what they can to get out of the position a subpoena puts them in,” Scheer said. Broussard’s credibility is expected to be the focal point of a trial that could last four months or longer. Defense lawyers have said they intend to wage what one called “one big legal battle” over his testimony. The trial is scheduled to begin March 21 before Alameda County Superior Court Judge Thomas Reardon. Krum and Peretti declined to comment Thursday. In one unaired portion of the interview, Broussard told Cooper that he wasn’t worried about his own life being in danger. “I’m on 23-hour lock down … If anything happens to me, we’ll know whose fault it is,” Broussard said. In another segment, Broussard described the bakery as “the black man’s army” and that Bey IV was its commander. The interviewed aired in February 2008 and served as Broussard’s denial of his Aug. 3, 2007, confession. After detectives left him alone with Bey IV for seven minutes, he reversed himself and admitted killing Bailey — but said he conceived and carried out the crime alone. He told Cooper and the grand jury that Bey IV pressured him to say he acted alone to protect the bakery, saying it was a test from God. Contact the reporters at tpeele@bayareanewsgroup.com and jrichman@bayareanewsgroup.com. Follow them at Twitter.com/thomas_peele and Twitter.com/josh_richman.